Below is a discussion of figures from Chapter 2 of the Foresight Africa 2017 report, which explores six overarching themes that provide opportunities for Africa to overcome its obstacles and spur inclusive growth. Read the full chapter on increasing employment opportunities here. The International Labor Organization (ILO) states that employment prospects in sub-Saharan Africa are presently stagnating due to low productivity attributed to the region’s lack of economic diversification. 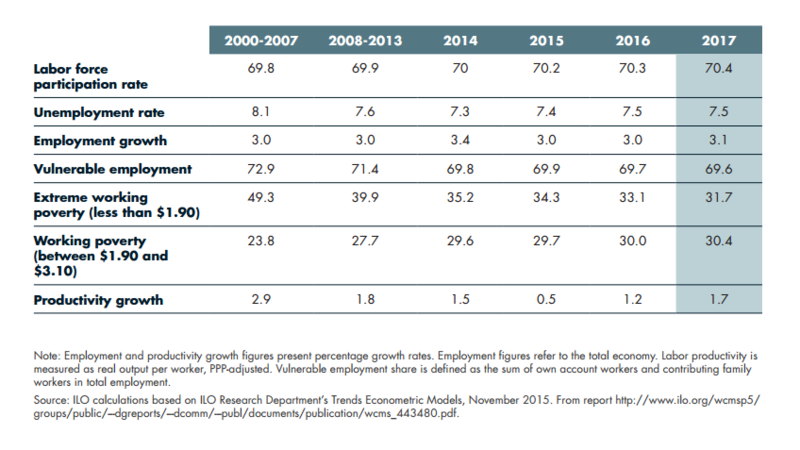 Table 1 shows the evolution of the African labor market over the last 16 years and the predictions for 2017. Labor force participation has slightly improved, a small 0.9 percent increase. The unemployment rate has dropped to 7.5 percent, slightly above the world average of 5.7 percent. Vulnerable employment has declined by 4.5 percent. Despite this progress, though, in 2016, the region had the second highest vulnerable employment rate, behind southern Asia. Extreme working poverty has dropped, but working poverty has grown. Looking forward into 2017, employment growth remains stagnant around a rate of 3 percent per year and the unemployment rate is also predicted not to change. In addition to outlining the employment levels in sub-Saharan Africa, this year’s Foresight Africa, as seen in Figure 1, explores the structure of employment in the region. While the service sector is increasingly absorbing Africa’s labor force, the continent’s employment prospects are presently concentrated in the agricultural sector. In most African countries, the agricultural sector employs an average of 54 percent of the working population. In Burundi, Burkina Faso, and Madagascar, more than 80 percent of the labor force works in agriculture. Still, there are a few outliers—such as Angola, South Africa, and Mauritius—where the agricultural sector only employs 5.1, 4.6, and 7.8 percent of the population, respectively. In these countries, the service sector employs more than 60 percent of the working population. The industrial sector, which is historically deemed highly productive, employs the smallest share of sub-Saharan Africa’s labor force. Still, there are two countries where the share of people employed in the industrial sector surpasses that of the agricultural sector: Mauritius and South Africa. In Mauritius, the industrial sector employs 27 percent of the working population. One third of Mauritius’ exports come from the country’s textile industry. In South Africa, the service industry employs one quarter of the working population.